Photograph 1 - The Salt Lake from Eagle Beach, Utah - the water was NOT SALTY but FRESH! 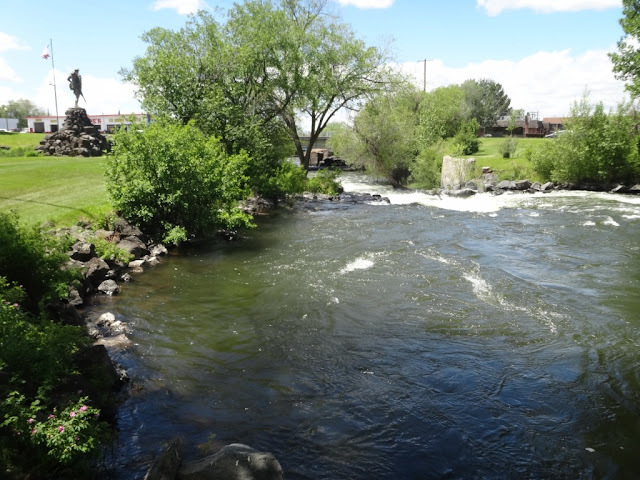 Photograph 2 - The Snake River flowing through the town of St Anthony, Idaho. 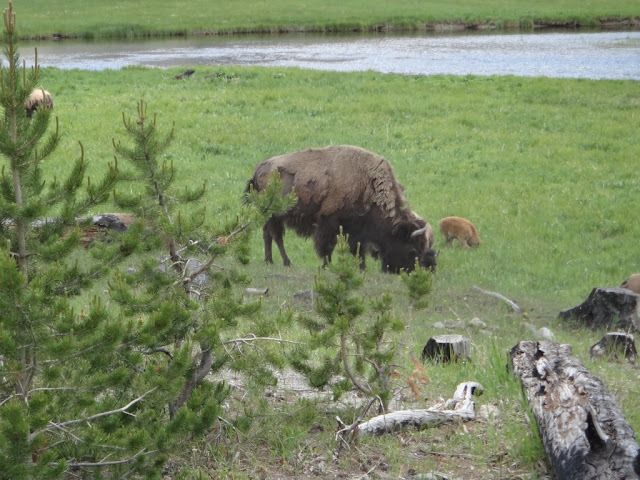 Photograph 3 - A bison with calf, taken just inside the Yellowstone National Park, west entrance, Wyoming. Photograph 4 - Same location as above, with the extended family. 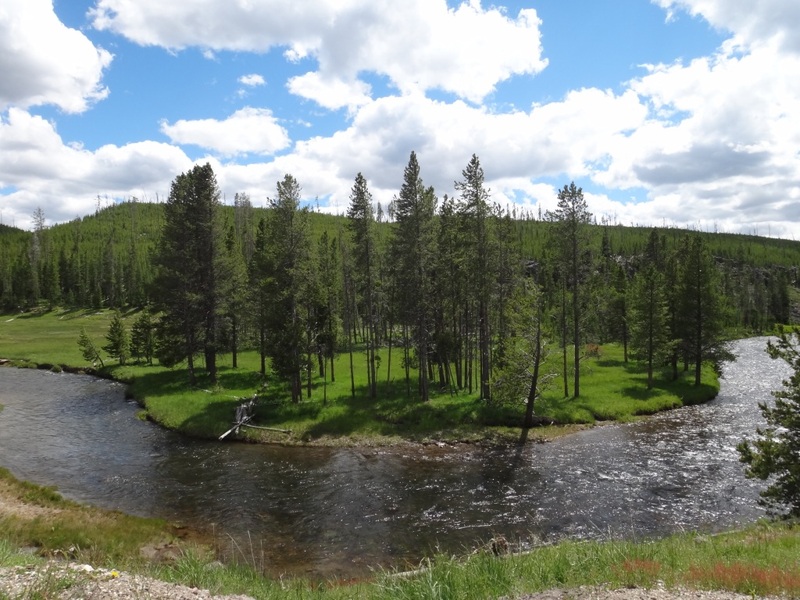 Photograph 5 - The Madison River, inside the Yellowstone National Park, Wyoming. Photograph 6 - We believe this is a Pronghorn, grazing near our accommodation, Gardiner, Montana. 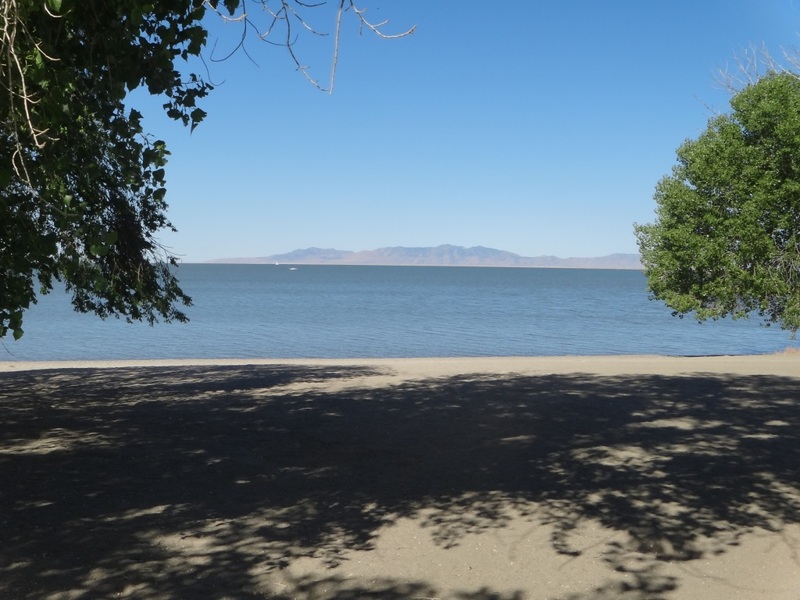 Today, we were educated - the Salt Lake that embraces Salt Lake City is fresh!! Well, when we stopped to look at the lake north of the city we tasted the water and it was fresh - true! We left our great accommodation, Little America Hotel, at 8:15am and within a few minutes we entered the mainstream of the I-15 heading north. Trucks, RVs and all sorts of large vehicles dominate this expressway and our poor Connie was like a fish out of water. Before pressing on with our day, we like to mention that the Little America Hotel is highly recommended to any traveler when visiting Salt Lake City - people are friendly, it has a 5 star atmosphere and located very close to all of the city's attraction - and reasonable inexpensive. Our journey north passed through four state borders - Utah to Idaho, Idaho to Montana, Montana to Wyoming and Wyoming back into Montana (just) - all in eight hours! We are only six klms from the Wyoming border and Yellowstone National Park northern entrance. We stopped for lunch at a place called St Anthony in Idaho and it was cold (interestingly, the weather was sunny and normal). The Snake River passes through this town and rages down several rapids - quite impressive. 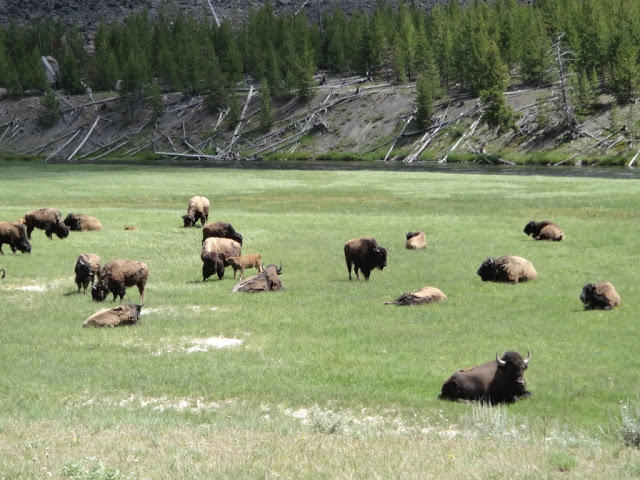 We winded in and out of Idaho and Montana and entered Yellowstone National Park at its western entrance - paid the seven day $25USD entry fee and inwards we went. We passed a herd of bison, Anne saw a skunk (pepe le pew we think), and Pronghorn deer. We have yet to see a grizzly or a black bear. 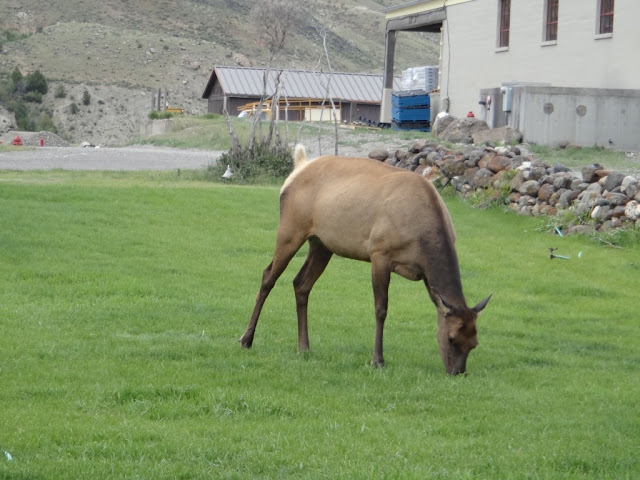 Hopefully tomorrow we will charge our picnic basket with the right sort of food and look for Yogi - nah, just joking, it is illegal to feed any animals here in the park. Today we only traveled the western end of the Park to reach Gardiner (our accommodation) and drove along the Madison River then north to Mammoth Hot Springs. Tomorrow we will do the loop and visit the parks most famous sites such as Old Faithful Geyser and the other geological sites that inhabit the park. All we can say at this stage is Yellowstone National Park is what they say - a must see, beautiful scenery and a delight to be here. Just one last thing before we sign off - Gardiner, Montana is a mountain town that reminds us of a cowboy and western atmosphere. It is on the base of snow-capped mountains (still covered with ice even in summer) and buildings are designed like Dodge City in the 1870's - we like it. So until tomorrow - cheers. PS - We have gained more knowledge how this blogspot works. Hopefully the pictures will be better and larger.